Storyboarding is an amazing job that combines one-part artist, one-part writer and one-part director. It’s one of the more creative jobs in the entertainment industry with storyboarding gigs for everything: games, movies, and TV shows. 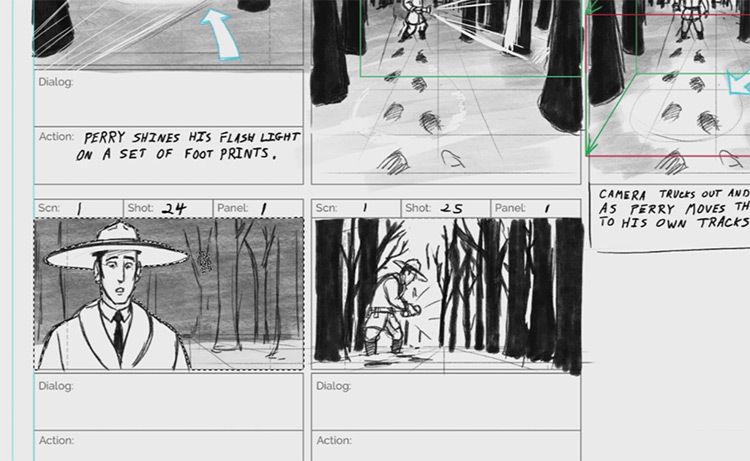 But learning how to storyboard is a tremendous challenge that pushes beyond just drawing well. Bloop Animation has a massive video course titled Storyboarding Foundations covering the process of storyboarding for animation. It totals over 5 hours of runtime with 50+ HD videos teaching the fundamentals of storyboarding from scratch. It’s a massive course and probably the most affordable one you’ll find. But can it really help you master the art of professional storyboarding? I’ll share my honest thoughts in this review along with details on what you get in this premium course. This truly is an intro to storyboarding from start to finish. It’s a guided course where you work through chapters starting from the very basics of what storyboarding actually entails, then move into more advanced topics & software. You’ll learn common film/animation terms along with how to properly read & draw storyboards. Many videos also talk about directing and how you should structure shots, how to plan compositions, and how to create believable character expressions. Towards the end of the course you’ll work through sample exercises teaching you a professional’s workflow in popular software like Storyboard Pro. I actually did a full review of Bloop Animation’s courses so you might want to read that to learn more about what they offer. I think Bloop is one of the best online teaching resources for aspiring animators. Bloop covers both 2D and 3D work and the concepts in this storyboarding course apply to all types of animation. You can find a few storyboarding videos on the Bloop YouTube channel but those barely cover anything compared to this course. The YouTube channel offers free shorter tutorials so you can use those videos to check out the teaching style and see what you think. And I really enjoy the Bloop teaching style. It feels very laid-back yet informative. None of the videos feel stuffy or pretentious so they’re very approachable, plus the exercise videos are super easy to follow along with. Some people might actually prefer books on storyboarding since they can be more detailed. But the truth is many artists learn visually by watching and repeating, so Bloop Animation’s storyboard course is likely the best way to delve into storyboarding with no experience. Storyboarding Foundations comes with 9 modules, each with a handful of videos. You’ll notice the first three modules talk about storyboarding as a general concept. These chapters teach you how to plan scenes, how to advance the story, and how to generally design a storyboard from a concept in your mind. 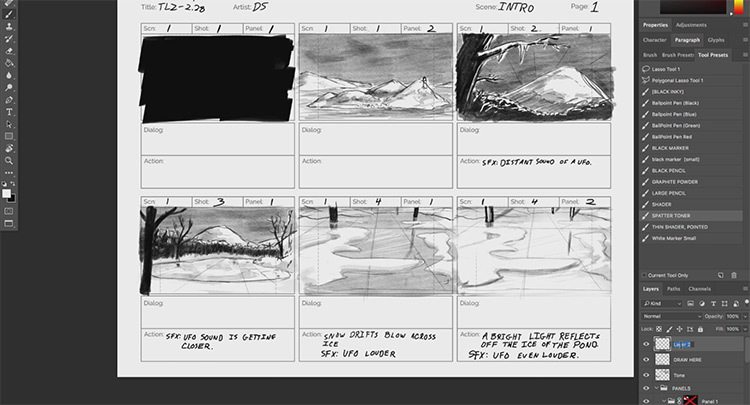 The later modules talk about specific programs for storyboarding. These 3 programs(Photoshop, SketchUp, and Storyboard Pro) are widely used by industry artists. If you plan to work as a storyboard artist then it helps to learn all of these programs. Most exercises focus on Toon Boom’s Storyboard Pro. In fact, this entire Bloop video series feels like a massive storyboarding course with a mini-course on how to use this software. Working through the first 3 modules may feel a bit like a lecture hall. But that information is vital to understanding how storyboards work. Even if you’ve done a few boards or researched the topic a little on your own, the early videos will probably still teach you new stuff. With that said, much of the the course is about learning to use proper software and create storyboards with that software. So you should definitely practice on your own too. Get into a routine of daily storyboarding, even just for 20-30 minutes on paper. You’ll see much greater progress if you’re practicing daily. Think of this course more like the foundation needed to start storyboard properly. 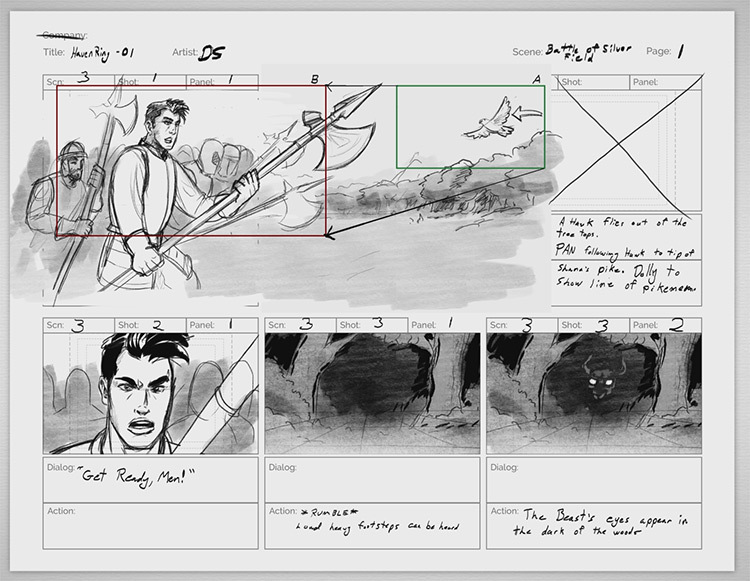 By the end of this course you’ll have a lot of underlying knowledge of how storyboards work, but you’ll still need to create your own boards to practice your storytelling and scene design. Once you buy the course you immediately get access to all the videos from your Bloop Animation account. You can stream the videos online or download them locally to your computer. They come as MP4 videos which should work everywhere(desktops & smartphones). The videos are also 1080p HD which looks crystal-clear on my widescreen monitor. And this course comes with a few extras to accompany the videos. You can download these right from your user account page by clicking the “extras” link. There’s a “course files” .zip folder which includes all the exercise files used throughout the course. Plus you get a pack of free storyboard templates courtesy of Bloop Animation. How cool! This pack includes 6 templates in different styles & with different thumbnail sizes. They’re large enough to print and they come in two formats: PNG and PSD. If you know your way around Photoshop you can customize the PSD storyboard template files to look however you want. Plus you’ll get a full video of a completed animatic from the exercise lessons. You can use this to plan animatics as you practice storyboarding on your own. I have nothing but praise for the video quality and the extra course assets. You get access to everything from your Bloop account and everything is downloadable so you can easily save this course locally too. So let’s get practical: what will you take away from following this course? What sort of knowledge & skills will you gain from these videos? The obvious answer is more knowledge of storyboarding. But that’s kinda vague since storyboarding involves many techniques. I would not say this course explains too much about storytelling or screenwriting. That’s a whole separate subject and a deep one for sure. Bloop’s Storyboarding Foundations ultimately covers the process of reading, planning, and crafting storyboards that make sense. You’ll learn how to design compositions that fit proportionally into any sized storyboard squares. You’ll learn about shots and sequences, some of the most basic directorial terms in filmmaking. And you’ll learn the entire process of storyboarding from rough sketches to thumbnails, how to do an initial rough pass and how to polish a final pass to clean up your work. It’s basically a complete course on a storyboard artist’s workflow to help you go from square 1 and move through the complex maze of learning how to storyboard. Along with all of that you’ll also learn how to use three programs for storyboarding: Adobe Photoshop, Toon Boom Storyboard Pro, and SketchUp. You should be comfortable with at least two of those programs if you want to do any sort of professional storyboarding or animation work. From simple 2D boards to 3D environments in SketchUp and everything inbetween, you’ll walk away with a commanding knowledge of the storyboarding process and the best software to use. All Bloop Animation courses sell for a single price of $67/course when you buy individually. I think it’s a reasonable price considering everything you get in this course. But you can get a discount if you purchase a package of many courses together. If your only goal is to learn storyboarding you may just want to stick to the single plan. But if you’re brand new to animation then I recommend the Master Plan instead. This comes with both the Storyboarding + Animation Foundations courses along with any 3rd course of your choice. Plus this package includes Bloop’s premium book Animation For Beginners alongside the 3 video courses, all for a total of $147. If you go this route you can nab the Toon Boom course or the TVPaint course along with both foundational courses. You’ll end up saving $85 off regular prices. A pretty nice deal for everything you get. This package feels like a jump start into storyboarding & animation for beginners with all the learning materials you need to get started. And Bloop’s pricing is definitely reasonable compared to other storyboarding courses… for example Sherm Cohen’s “Storyboarding Secrets” charges $500 for the entire thing. Bloop’s Storyboarding Foundations course is almost 90% cheaper! Nobody wants to blow money they don’t have, but nobody wants a cheap crappy video course either. I think Bloop strikes a nice balance between quality & price so it’s accessible to most people who seriously want to learn how to board. If you’re new to animation or storyboarding then I absolutely recommend Bloop’s Storyboarding Foundations course. This is one of the best introductions to storyboarding for anyone regardless of background. Even if you’re new to drawing you can still pick up this course and learn a ton. Granted you may not have the fundamental skills necessary to draw perfect storyboards with accuracy. But you can start learning how they work & practice some boarding along with your regular drawing exercises. The 6 free storyboarding templates make for a nice little extra too. You can print copies and use them traditionally, or use them as templates in any drawing software for storyboarding digitally. And considering the distinct lack of video courses on storyboarding, I have to praise Bloop’s Storyboarding Foundations for doing it right. If you follow this course all the way through you’ll develop a clear direction for practicing and improving your storyboarding skills over time. Anyone serious about storyboarding should definitely nab a copy of the course and follow all these lessons to a tee.